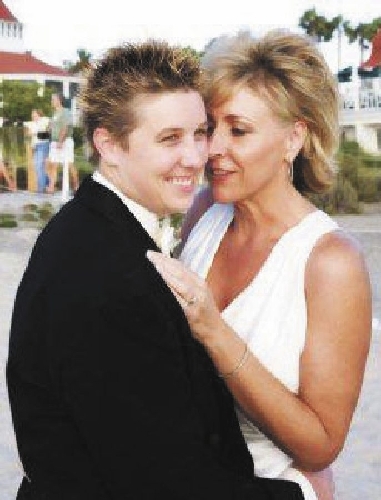 Jessie McCaskill embraced her partner, Dallas Augustine, after they made a lifetime commitment to each other in 2007. McCaskill, shown in a picture on her Facebook page, wore a white dress. Augustine donned a black tuxedo. The couple smiled widely, the image of wedding bliss. McCaskill wrote on the social media website that she had found the one. “Well, it all worked out in the end,” she wrote. But the couple’s relationship was far from picture perfect. On Tuesday, Phoenix police said the two women were found dead in their home Monday night in an apparent murder-suicide, and Augustine, 32, daughter of murdered Nevada politician Kathy Augustine, was suspected of killing 50-year-old McCaskill. Dallas Augustine then killed herself, police said. A weapon was found but was not identified. An employee at the Maricopa County, Ariz., medical examiner’s office said Augustine and McCaskill are scheduled for autopsies Friday. According to Augustine’s Facebook page, she married McCaskill on Sept. 22, 2007, in Coronado, Calif.
Officers went to the couple’s home at 8:30 p.m. Monday after a family member called police. There was evidence that the relationship had been strained, and one of the women had packed bags and was preparing to leave, police said. Augustine’s uncle Phil Alfano said the family received the news early Tuesday. He did not have details. Augustine was an officer with the Arizona Department of Corrections, spokesman Bill Lamoreaux confirmed. He did not know how long she had been employed there. Her mother, Kathy Augustine, died July 8, 2006, in the Reno home she shared with husband Chaz Higgs. He said she had had a heart attack, but Reno police soon turned their attention to Higgs, a critical care nurse who had made an offhand comment to a colleague about using a nearly untraceable paralytic drug to kill a spouse. Investigators found traces of the drug, succinylcholine, in Kathy Augustine’s urine. Higgs was convicted of murder in June 2007 and is serving a life sentence. Former Las Vegas Review-Journal reporter Glenn Puit wrote the book “In Her Prime,” which chronicled the rise and fall of Kathy Augustine. Puit said Tuesday that Dallas Augustine refused to talk to him for the book and was largely isolated from her mother’s family. “Clearly the relationship between mother and daughter was strained,” he said. Alfano said Augustine had problems but never wanted her family’s help. Although the relationship between mother and daughter might have been strained, Dallas Augustine tried to follow in her mother’s footsteps. In May 2008, she filed for the open Assembly District 12 seat her mother held when she first entered politics in 1992. “I never anticipated seeking her old seat, but I think she would be proud of what I am doing,” a 28-year-old Dallas Augustine told the Review-Journal at the time. 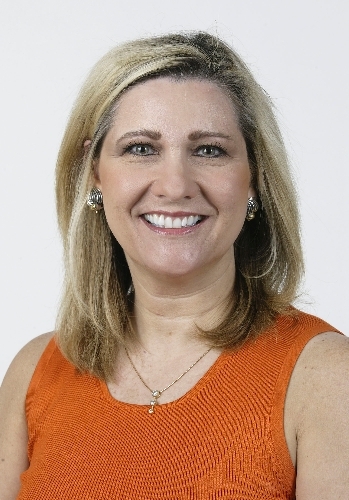 Kathy Augustine served one term in the Assembly, two terms as state senator and then two terms as state controller. She was running for state treasurer at the time of her death. 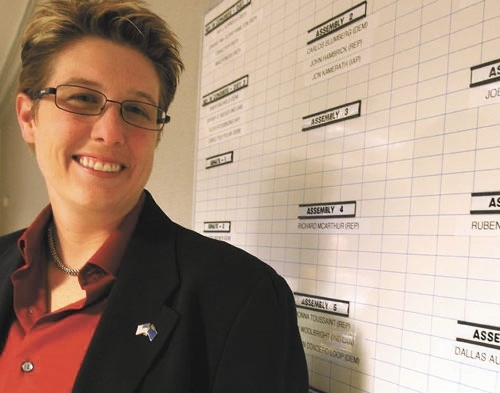 In 2004, she became the first Nevada public official to be impeached and convicted after using office equipment in the controller’s office to aid her 2002 re-election campaign. Augustine was censured but not removed from office for the offense. Dallas Augustine did not know Higgs well and initially did not suspect him of the murder. Her mother had told her he made her happy. At the time Dallas Augustine sought election, she ran as a Republican like her mother. She faced Democratic challenger James Ohrenschall, the incumbent, and lost by more than 6,000 votes in the heavily Democratic district. Higgs and Kathy Augustine were married three years at the time she was rushed unconscious to a Reno hospital in 2006. Higgs told doctors and nurses, some of whom he had worked with, that she had suffered an apparent heart attack brought on by the stress of her campaign for state treasurer. She died three days later at Washoe Medical Center. But samples tested by the FBI National Crime Laboratory found traces of succinylcholine in Augustine’s urine. Fellow nurses described Higgs as an excellent nurse who had saved many patients’ lives. But they also testified that he had confided in them his distaste for Augustine and that he had begun a flirtatious relationship with a hospital employee. During the murder trial, Higgs unsuccessfully attempted suicide by slashing his wrists with a kitchen knife the morning before the case was to go to a jury. Higgs eventually received a life term with the possibility of parole after 20 years. Review-Journal writer Kristi Jourdan contributed to this report. Contact reporter Mike Blasky at mblasky@reviewjournal.com or 702-383-0283. Contact reporter Antonio Planas at aplanas@reviewjournal.com or 702-383-4638.